The Holy Spirit Prep mission is to form the Catholic person, instilling the principles of the gospel in our students from our youngest students to our high school seniors; and, indeed, in their families. This involves more than simply teaching doctrines. 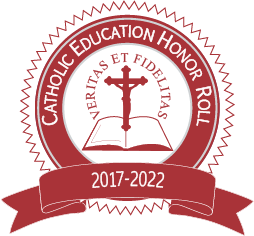 St. Francis of Assisi told his followers: “Preach the gospel, and if necessary, use words.” On that principle, the greatest measurement of our success as a premier, Catholic preparatory school will always be reflected, first and foremost, by having graduates who know how to live the gospel in their daily lives. As Rector of Holy Spirit Prep, it is my responsibility and privilege to ensure that the School’s mission of providing a classical, college preparatory education is anchored in that kind of authentically Catholic environment. Our Head Chaplain then guides faculty and administration in incorporating Catholic faith into all aspects of school life on a daily basis. This is evident in our school Masses, in apostolates, in the classroom, on the athletic field, on the stage – in every sector of community life. The Catholic Church holds that parents are the primary educators of their children. That means that the true Catholic school recognizes that role and becomes a partner with the parent in the formation of the child. It also means, of course, that the parent is also on the right track. So, the relationship of the school to the parent is a dual one – partner and guide. So, we invite, and love to have, the parents involved in our Masses and school life.